Which Is Faster, a Horse or a Camel, and Which Animal Would Win a 100 Mile Race? Both the horse and the camel have been clocked at similar racing speeds, between 35 and 40 mph, with the fastest horse running just a little bit faster than the fastest camel. Camel racing is a popular sport in countries such as India, Saudi Arabia, Bahrain, Jordan, United Arab Emirates, and Mongolia. 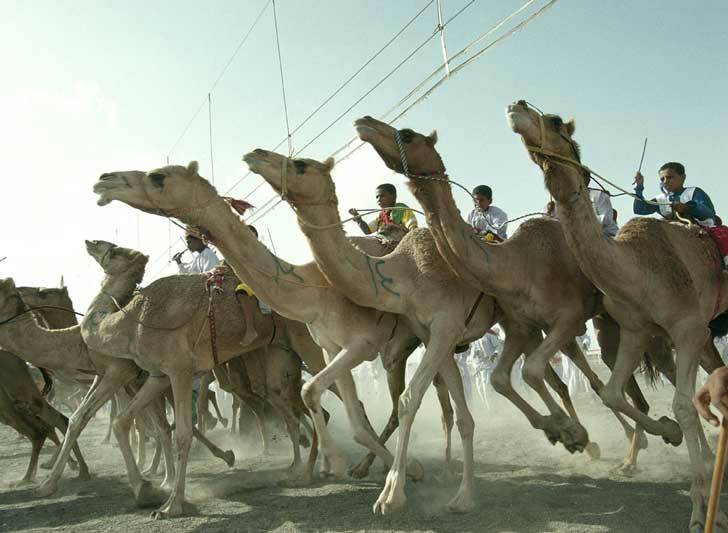 Professional camel racing events are often organized for betting and as tourist attraction. Child jockeys are often used in camel racing and controversy over human rights issues has led to increased use of robot-controlled camels. You’re not the first to ask this question, by the way. In 1892 a horse and a camel competed in a famous one-day, 109.4-mile race in Australia. The horse won by a hair, then promptly collapsed and died. The camel, though second, crossed the finish line relatively unfazed by the experience. So the answer might be, in a 109.4-mile race, the horse will win, but in a 110-mile race, bet on the camel. Why is the Mile 5280 Feet instead of an even 5000 Feet and how many Furlongs are in a Mile? Why Is a Country Mile Longer Than the Average Mile and Where Did the Term Come From? Where did the mile come from and Who decided the length of a mile?